As anxious as we were, we did go to bed and managed to sleep. During the night, the rain abated, the tide slackened and the waters of Crippen Creek receded and returned to the confines of its banks and never reached our house. Whew! It became abundantly clear how effective the creek bank restoration project was, allowing the creek to flood where it should and taking the energy off of critical points. Thank you Darin Houpt and the Wahkiakum County Conservation District. With the roads now passable we managed to get out and take a few pictures of the area. If I have learned anything over my years, it is that when portentous events invade our lives that we should not be too hasty to label them as "bad" or "negative." I find these events worthy of reflection. When a seeming calamity strikes it's only natural to ask, "what do I do about it?" As important as that question is, I believe a more important question to ask is, "what do I do with it?" It's like the tale of a farmer that snags his plow on something in the field. Rather than curse his interruption he stops to examine it, dig it up and in so doing, unearths a buried treasure. And while this weather event interrupted our plans, we too found our treasures. Our lives intersected with neighbors who came to check on our welfare. I marvel at how a crisis brings out the best in people. The roads cleared in time to allow us to return to Portland to and support a dear friend who lost her brother. As one thing leads to another, we found ourselves reconnecting with some friends that we have not seen for some time. We were greatly nourished by the good wishes, thoughts and prayers that we received from family and friends via phone calls and emails. Thank you! Thank you! Thank you! Torrential rains, several feet of melting snow in the Willapa Hills, and high tides have converged to create a storm of apocalyptic proportions here in SW Washington. 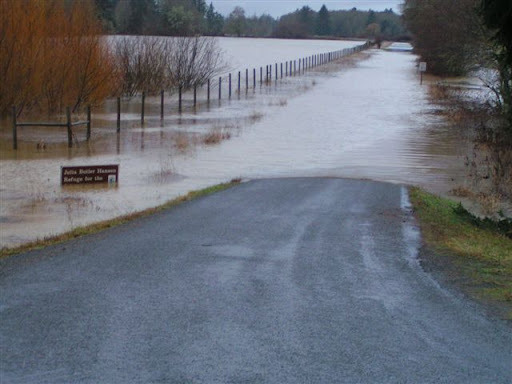 Wahkiakakum County has been declared a disaster area. Almost four inches of rain has fallen here in the last 24 hours and they say we have not seen the worst of it yet. So far our house is high and dry but it's looking kind of dicey on the west side of the house. Although many of the county roads are impassable due to high water a few angels appeared to check on us and brought us some sandbags just in case. I never cease to be amazed by the kindness of the people who live in Wahkiakum County. We like waterfront property, but not this much. Sleep will not come easily tonight as we wait and wonder how much worse this storm will get. But in this moment we are well and hope the same for all of you. We'll be in touch soon..."God willing and the creek don't rise." By the way, that saying really has nothing to do with creeks. Cannoli has to be one of the greatest treasures of Sicilian cuisine. It was certainly one of my favorite desserts growing up and is always a hit with our family during the holidays. Growing up in an Italian-American community like Rochester, NY, cannoli was readily available at the numerous Italian bakeries and delis and even at Wegman's grocery store. But alas, here in the Pacific Northwest, if you want cannoli you have to make it yourself. Although making the shells is a lot of work, you really end up with a superior product. Homemade shells should be light, crisp and shatter when you bite into them. The ricotta cream filling should be smooth and not grainy. It is important to strain the ricotta overnight in cheesecloth to drain off some of the water. I sweeten mine with powdered sugar and flavor it with a little vanilla extract, mini chocolate chip morsels and just a hint of fresh orange zest. I am not a fan of the candied fruit that appears in some recipes but sometimes I add a little goat cheese to the ricotta in an effort to approximate the tanginess of sheepsmilk ricotta that would be available in Sicily. Never fill your cannoli shells before serving time nor should you purchase cannoli that are already filled because the shells will become soggy if they sit for too long. 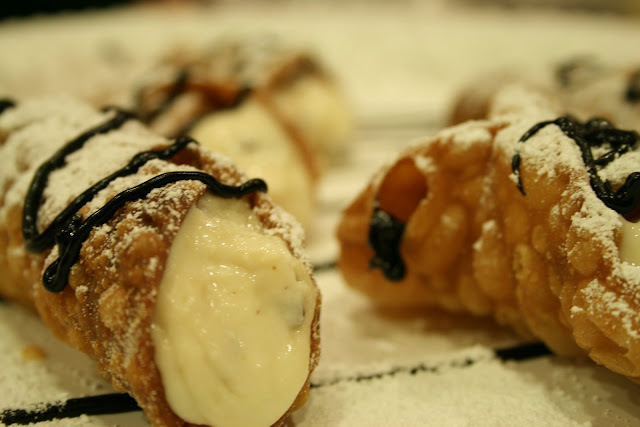 If you are not familiar with cannoli you should know that cannoli is actually the plural form of cannolo. But who ever orders just one cannolo? And if you did, the clerk would probably look at you like you had a third eye. Common usage prevails here in America so feel free to call one of these pastry tubes a cannoli and use an "s" to pluralize it if you wish. The next time someone asks you to bring the dessert to a party, remember the advice of Peter Clemenza in The Godfather, "leave the gun, take the cannoli." We would love to hear from all you cannoli lovers so please post your comments about the best cannoli you have had and where to get them. "If the only prayer we ever say in our life is 'Thank You,' that will be enough." It is with that sentiment in mind that we say "Thank You" to our families, friends and guests and patrons of Crippen Creek that have encouraged us and supported us in this wonderful adventure. May you all be blessed with a very Happy New Year! The year ended with one of the wildest winters we can recall since living in the Pacific Northwest. Almost 2 feet of snow fell here in Skamokawa and although it created an awesome winter wonderland, it proved to be a bit much for an area that is unaccustomed to it. It took hours of digging, pushing and towing to get cars in and out of here. Our beloved hoop house collapsed under the weight of the snow and the stovepipe on our barn's wood stove came crashing down in an avalanche of melting snow. We are grateful for wonderful neighbors like Al McClain who dug us out.